174 in stock Need More ? The role of the Supreme Court has often been considered out of reach and incomprehensible to the vast majority of the public, while judges might be seen as a caste apart from society, remote to most people. The Power of Judges tries to defy this logic, exploring the fundamental concept of justice and explaining in a simple way the main functions of the courts, the challenges they face and the complexity of the judicial system. 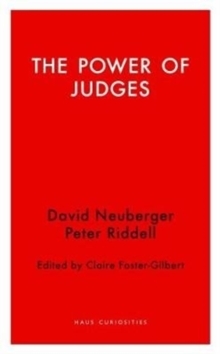 In a remarkable effort to make the judiciary more accessible, David Neuberger and Peter Riddell lead the reader through a vast array of subjects such as the relationships between morality and law and between Parliament and the judiciary. They explain the effects of cuts in legal aid and try to shed light on complex and controversial subjects like the role of arbitration and mediation, the matter of assisted dying and the complex balance of dealing with mass terrorism while protecting personal liberty. In the book's final chapters the authors question the validity of an unwritten constitution and the robustness of the legal system today. The book also offers a comparison of the UK's legal system with its counterparts in the US and Germany. Full of insights, The Power of Judges is an informative and accessible account of the UK judicial system, its contribution to running the country and the challenges it faces, including the many threats to its effectiveness.